It's Mother's Day this Sunday so, in honor of the incredible women in our lives, here are the ten best moms science fiction and fantasy television has to offer. The fate of humanity rested with Sarah Connor and her ability to protect son John from the artificial intelligence Skynet. She joined forces with pro-resistance machines and traveled through time looking for any way to prevent the coming apocalypse. Joyce and Buffy often had a rocky relationship like many mothers and daughters have when both are strong-willed. It never stopped Joyce from always trying to do what was right for Buffy and, later, Dawn. She opened her home and heart to her daughter's friends and even took on proverbial monsters like Vice Principal Snyder. Single mother Dr. Allison Blake ran the government's biggest research and development venture while caring for her daughter and autistic son in the wacky and sometimes dangerous town of Eureka. Week after week, Allison and some of the town's brightest scientists helped protagonist Jack Carter solve baffling mysteries and save the town. I have high hopes for new single mom Fauxlivia (aka the alternate universe's Olivia Dunham.) The Fringe Division agent didn't even get nine months to get used to the idea of having a child before she was kidnapped and forced in to early labor. Fauxlivia entrusted her adored baby to the very best person possible to protect her son, her immediate superior Lincoln Lee, when she set off alone to save an entire universe. FBI agent and single mom Erica Evans secretly took on a whole species of aliens to protect her son and the rest of the universe from the V's nefarious goals. Welsh Torchwood field agent and new mom Gwen Cooper saved the world countless times from all sorts of aliens and apocalypses, but one of her greatest accomplishments will to continue to protect the globe while raising her baby. Martha and her husband Jonathan took in a little boy they found in a field and raised Clark as their own. She protected his secret as he grew and never stopped watching out for him even when he was an adult with incredible powers. The once state senator even took on a secret identity, the Red Queen, to protect her only son. Therapist Nicole Trager didn't know anything about the mysterious and seemingly mentally challenged teenager when she first encountered Kyle. She did, however, know that he needed help. Nicole took him home with her to protect and raise him as her own. Psychic Allison DuBois worked for Phoenix's District Attorney helping to solve and prevent often gruesome crimes while raising three psychic daughters with husband Joe. Despite the negative side effects of being a psychic, like constantly having to overcome disbelief and deal with paranormal problems, the most important thing in her life was her family. 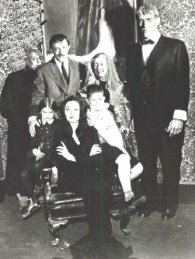 Addams family matriarch Morticia was extremely ahead of her time. She worked to protect local wetlands (then called swamps), rewrote fairy tales to correct stereotypes, and taught her children through example to be open-minded and kind to groups of people the rest of society eschewed, like beatniks. What do you think? Were there any moms that should be on the list that we left out? Let us know in the comments! Great list! For my money, the Joyce-Buffy relationship is one of the most well-written mother-daughter relationships in television. Thanks, AJ! The Joyce-Buffy relationship was my favorite because of that reason. In fact, I think the episode where Joyce dies is one of the best written episodes on television. It felt so incredibly real, it was if I was experiencing it with the gang. You compiled a great list. I also really liked Samantha Stevens and who wouldn't Endora for a grandma. I also agree with Megan. That just made me cry. This was a great list.